Enhance your home with premium vinyl flooring for some of the industry’s top manufacturers. At Flooring America of Bradenton, we proudly carry an unmatched selection of flooring products at prices few could refuse. As a locally owned and operated flooring showroom, we’re committed to helping ambitious shoppers find the best floors for their home remodeling projects. Before you get your next project underway, visit our store to discover all of the flooring options available to you. A vinyl tile floor is cost-effective, durable, water-resistant, and easy to maintain. At our expansive showroom, we proudly carry an impressive assortment of luxury vinyl flooring in Brandenton, FL. Our choices come in a medley of colors, patterns, and styles. Shoppers visiting our showroom should have no trouble finding the right luxury vinyl tile floor that suits their renovations. No matter what your taste or preference, you are sure to find a great flooring choice that speaks to your vision. Due to their unique composition, our vinyl tile and luxury vinyl plank flooring can be crafted to offer the look of real stone and hardwood flooring respectively with unmatched realism. When you choose any of our resilient flooring options, you can enjoy the unique appeal of authentic looking stone or wood flooring in areas of the home that typically aren’t adequately suited for either. Best of all, you’ll enjoy top-quality floors that offer excellent appeal at only a fraction of the real thing. When you choose one of our exceptional floors, you can be certain that your new underfoot surface will perform well, even if you’re planning to dress a moisture-prone space such as a bathroom or kitchen. Cleaning these materials is as simple as regularly vacuuming them and occasionally wiping them down with a damp mop. 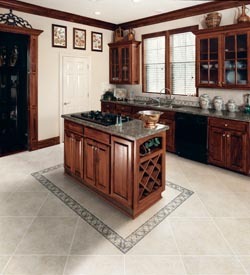 Are you uncertain which of vinyl flooring selections would best suit your remodeling project? Share your design aspirations with our knowledgeable team members and we’ll gladly help you find a quality flooring selection that’s sure to suit your needs. Once you’re happy with your choice, our skilled installation crew will ensure your new flooring is placed perfectly. Put your luxury vinyl tile installation needs in the hands of our experienced flooring specialists and we’ll ensure that your new solution is positioned precisely. Rest assured, our professionals will leave you with a new floor that will continue to impress long after it’s been installed. Contact us our flooring specialists to ensure your new luxury vinyl tile floors are placed perfectly in your home. We proudly serve home and business owners in Bradenton, Sarasota, North Sarasota, and Palmetto, Florida, and surrounding areas.